These resources take an exploratory approach to the nature of English in use, in real-world contexts. The four clause types are a central part of English grammar. An understanding of declarative, imperative, interrogative and exclamative clause types can help students recognise how writers use these structures to create meaning in different ways, and can help them develop a better repertoire of structures in their own writing. You’re visiting a friend’s house. You’re in a cold room and the window is open. What can you say to each of the following to get the window shut? You’re carrying several boxes of DVDs and books. Then you drop one, spilling its contents all over the floor. You need help and there are people around who could be of assistance. What do you say to each of the following? 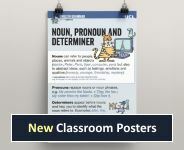 In this lesson, students will explore some of the different attitudes that people have towards language use, variation and change. They will be encouraged to adopt a critical approach to language study, thinking carefully about how language is intertwined with sociocultural factors. They will also be asked to reflect on their own attitudes to language. In this lesson, students will explore new modes of communication such as texting, online chat, and Facebook, which often come in for criticism from people who believe that they are damaging the way we use language. Students compare examples of English in use, including various written and spoken examples, and analyse them according to a scale. Forensic linguistics is a growing area of language study that combines the analysis of language with solving crimes. All of us use language in subtly (and sometimes not very subtly) different ways – so when we write or speak, we leave clues that sharp-eyed language detectives can pick up. In this resource, we take a quick look at the kinds of clues forensic linguists look for when they try to work out the identity of a writer. Forensic linguistics: how is it done? Forensic linguistics often uses a form of language analysis known as stylistics. In the past, stylistics was largely used to study the language styles of literature texts, but when used as part of forensic stylistics it is applied to all sorts of language, from letters, text messages and audio recordings of police interviews, through to suicide notes and ransom demands. So, what clues did you find? The police were convinced that the two sets of messages were actually from different people, and that Melinda hadn’t sent the messages on February 16th, but they needed evidence. This lesson resource is designed to draw attention to how we use different registers in a variety of written contexts. When we use language, we make a number of different lexical and grammatical choices, depending on the context, or 'situation of usage'. Identify some elements of spoken dialogue in an interview setting. Analyse some features of colloquial language, specifically the kinds of words and phrases that are used. The Activity page appears in the menu entitled 'This Unit' in the upper right corner of this page. It includes a video of an interview between Russell Brand and Ed Miliband, recorded just before the UK General Election in May 2015. Students get a sense of how spoken and written language vary by looking at short extracts of each, on various topics. Identify features of speech and writing. Compare and contrast speech and writing. Recognise the importance of genre in anlaysing language. This lesson includes 3 handouts, which can be downloaded below and printed for distribution to students. English is used in remarkably different ways around the world. Exploring that variation is an extremely effective tool towards understanding our own use of English. This lesson looks at some features of colloquial Singapore English.